This is a light caramel mousse made by combining a caramel base with whipped cream. There is very little gelatine, just enough to set it lightly, so you can better taste the caramel and the texture is light, moussy and creamy. Once you get the hang of working with gelatine it’s pretty easy and fast to make mousses but you should look out for a few things. 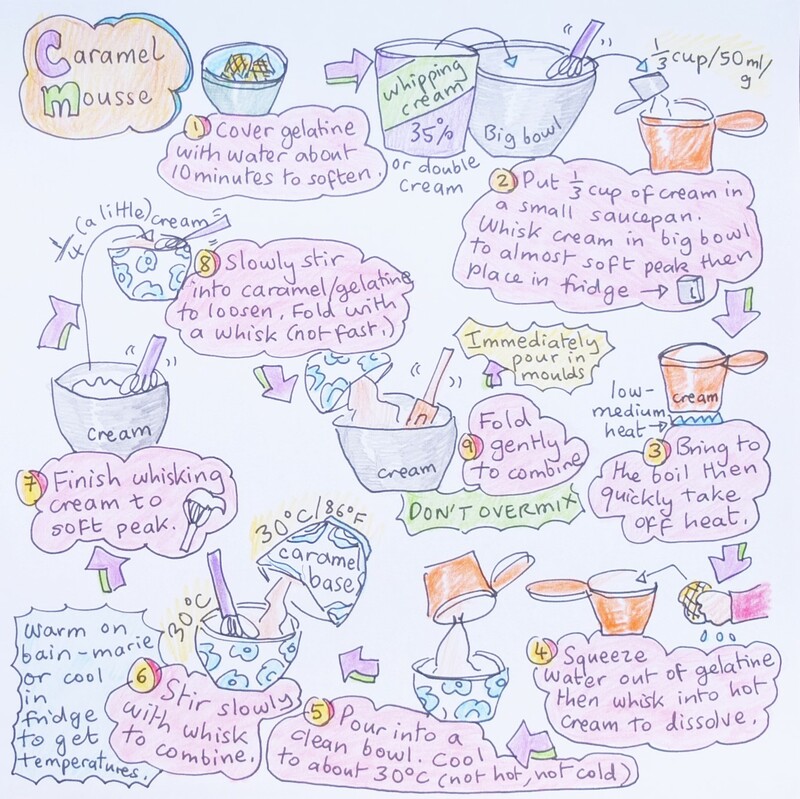 The main thing is to make sure the temperatures of the caramel base and gelatine are around 30°C/ 86°F and don’t allow the gelatine to set before combining – if the gelatine’s too cold you’ll get glooey lumps but too warm and it will melt the cream. Also, don’t overmix when you’re folding at the end or the mousse will flatten. Like most pàtisserie it’s not that complex if you just pay attention, follow the recipe and be precise. Then with practice you’ll find you start doing it all fast and naturally. Place 1/3 cup of the cream in a small heavy-based saucepan. Whisk the remaining cream in a big bowl until almost soft peak and place in the fridge. Heat the 1/2 cup of cream on a low-medium heat till just boiling. Take off the heat immediately. Squeeze out the water from the gelatine and whisk into the cream until it dissolves. Pour into a clean bowl and allow to cool till it reaches a temperature of around 30°C/ 86°F (feels neither hot nor cold to your little finger). Check with a sugar thermometre. Whisk the cream occasionally so that the gelatine doesn’t set firm or form lumps. Check your caramel is also at around 30°C/ 86°F. If not then cool in the fridge or reheat a little on a bain marie, as needed. When the cream/gelatine and caramel are at the right temperature, take the whipped cream out of the fridge and whisk to soft peak. Stir the cream/gelatine and caramel together with a whisk to combine. With the whisk slowly fold a little whipped cream into the caramel/gelatine/cream mixture to lighten it. Then with a rubber or silicone spatula fold the mixture into the remaining whipped cream in the big bowl. Do not overmix. Do this gently. Only whisk very lightly for a few seconds if it looks like there are lumps forming anywhere. Immediately pour your mousse into your moulds and set in the freezer from 4 hours or overnight. They’ll also keep for up to 2 weeks or more (just unmould and store in airtight tupperware in the freezer). P.S. To see an example of a dessert made with this mousse have a look at my Dreams of Florence, caramel-raspberry dome cakes.